Last Thursday evening, the Vassar community was invited on a musical journey as the first audience of the Modfest season was guided through a variety of locations where they had the chance to experience some of the finest music Vassar has to offer. While Meryl Streep was unfortunately not in attendance, the evening was packed with joy and contemplation as music rang out from the Chapel hall all the way to the library atrium and back. With this opening event, the annual Modfest festival began its 15th season on Vassar’s campus. A festival celebrating the arts in the 20th and 21st centuries, the spring series of arts events known as Modfest—this year focused on the theme of “Raising Voices”—looks to feature unique voices from across Vassar campus and the local community in the spoken word, visual and performing arts. While the campus is currently buzzing with excitement for Audra Mcdonald’s upcoming appearance at Skinner Hall, the final concert of the festival, Modfest has quietly gone through a changing of hands. As the beloved Professor of Music Richard Wilson retired last semester, he and his wife Adene Wilson stepped down from running the event after 14 years and handed off the reigns to co-chairs Associate Professor and Chair of Music and Director of Choral Activities Christine Howlett and Interdisciplinary Arts Coordinator Tom Pacio. Howlett, who, besides teaching music, conducts many of Vassar’s acclaimed choral groups, is grateful for all the work the Wilsons, especially Adene Wilson, have done in cultivating this event over the years. As Howlett explained, “Dee, who is an alumna, was the lead person on the event. She would connect with the different departments and ask, ‘What can you do? How can we bring these different collaborations to Modfest?’” As Modfest seeks to include as many different departments on campus as possible, successfully putting on an event like this every year is quite the accomplishment. 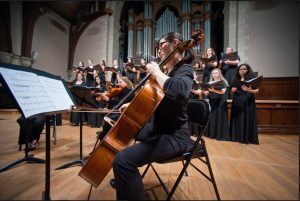 Thursday night began in the Chapel, where the Vassar College Women’s Chorus performed “How to Survive Winter,” a piece by American composer Jocelyn Hagen with poetry by Julia Klatt Singer. Accompanied by a string quartet made up of professional musicians from around the area (the only non-student performers of the evening), the choir, as always, sounded magnificent in the Chapel, whose acoustics are perfect for capturing the human voice. As the audience was ushered to each new space, any sense of the ordinary vanished, as they were invited into an extraordinary concert experience. The string quartet that performed in the library atrium was a highlight, as the sound of strings echoing through the space was breathtaking. The goal of the evening was to “embrace the space”: letting each location and ensemble work in a collaboration of sorts, creating a refreshing and exciting sound experience at each step along the way. Close to the end of the performance, the grandfather clock behind the string quartet began to ring opposite the performers. What might have derailed an excellent performance was easily shrugged off, incorporated into the music and the evening as a whole. The night continued with a lovely performance by the Majors ensemble in the Jade Parlor of Taylor Hall, and finally concluded with the Vassar College Choir, this time in the Frances Lehman Loeb Art Center. 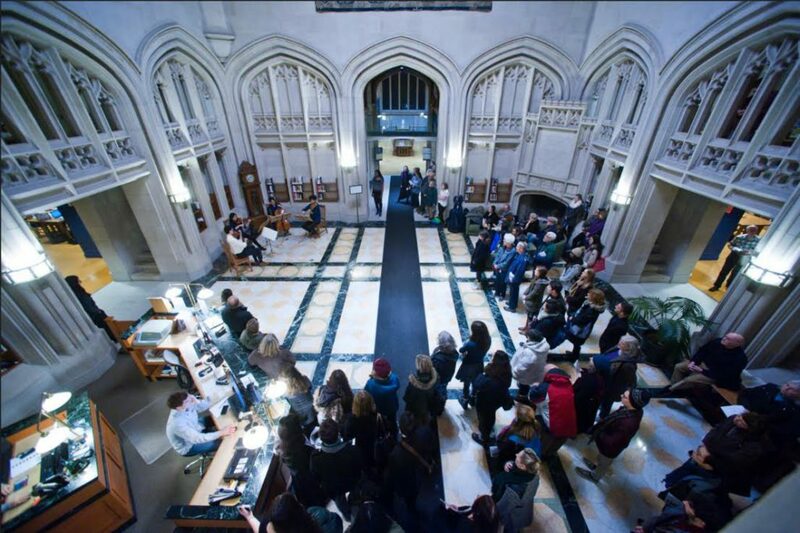 While many choirs performed throughout the night, this performance was entirely different from ones earlier in the evening, as the changing of locations from the vaulted Chapel to the modern architecture of the Loeb allowed for a distinct listening experience. The placement of the ensemble at the alcove situated on the top steps of the gallery allowed the voices to effortlessly carry throughout the entire Art Center, and their performance of “Leonardo Dreams of His Flying Machine” was the perfect conclusion to an extraordinary evening.